The Beast. The Thing. What was inhabiting No. 50 Berkeley Square? Very bad ton, I daresay. The stories varied, but a dandy had a dashed good notion to test the on-dit that No. 50 harbored a ghost. Full of blue ruin and holding a pistol, he spent the night in one of its rooms only to confront a “jet black shape” that leaped at him. Discharging his pistol, he was found dead with his eyes bulging, expired in the grip of apoplexy. Others say he managed to escape to endure another horrible fate–this Bond Street beau was the Lord Lyttleton who committed suicide by throwing himself down the stairs of Hagley Hall. Later, two sailors were offered lodging in the house. They too, offered fire against the apparition which appeared to them in the shape of a large man, and one died for his pains. This gave rise to the rumor the house was uninhabitable. Who was the man in the periwig? Joan Scott’s father was Major General John Scott, a man wealthy from card play. He instructed his daughters to never marry men with titles. His eldest disobeyed him and became Duchess of Portland. His youngest followed suit, and became Countess of Moray. Of all three, Joan (a viscountess in her own right!) was the only one to follow his wishes and married a politician. 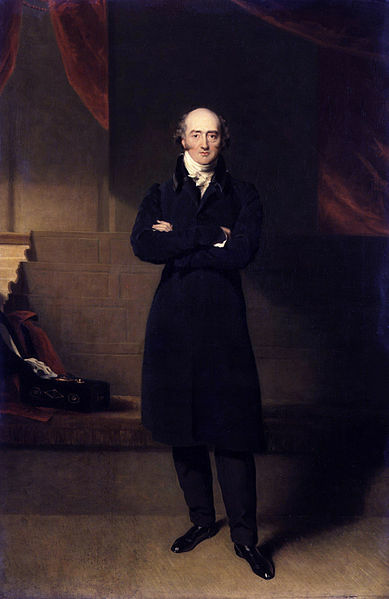 Her husband was George Canning (1770-1827), the Prime Minister of the shortest tenure. He was the son of an actress and as one man famously said, never follow a man who is born of an actress. But this did not deter him. As a member of Pitt’s government, this hard-boiled Tory challenged Lord Castlereagh to a duel and got shot in the thigh for his pains. He lived at No. 50 Berkeley Square. He was the most divisive man in government. The Regent refused to meet him in person because he was rumored to have had an affair with the consort Princess Caroline. He reduced his boss Lord Liverpool to tears and managed to force the poor man to apologize for it. In the end he was reduced to begging prominent Whigs to join his Tory government, including Lord Lansdowne. But he died before he could realize his life’s ambition, in the very same room where the most radical of Whigs had expired, Charles James Fox. They call him a lost leader. Perhaps he’s been found, in the rage of unfulfilled ambition. The location is appropriate. It’s now a bookstore. This entry was posted in Regency, Uncategorized and tagged Charles James Fox, Countess of Moray, Duchess of Portland, George IV, Hagley Hall, Lord Castlereaugh, Lord George Canning, Lord Liverpool, No. 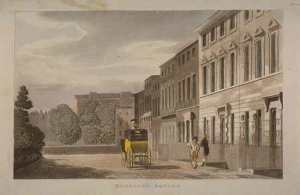 50 Berkeley Square, Princess Caroline, Viscountess Canning by Angelyn. Bookmark the permalink. Interesting post! Do you know the name of the bookstore? Maggs Brothers, I think. They’ve been there an age. I’m glad you liked it. Thanks for stopping by, Danielle. Interesting! Did you find any references to more recent sightings of the ghost? I wonder how the workers in the bookstore feel about it… Great post! Apparently there is a storewide reticence to discuss the matter. Not only bad ton, but bad business. I should think the notion of a ghost would make it more popular. Good post. That’s a great story. Interesting post. Have the employees encountered anything ghostly? If they have, they aren’t talking. Thanks for stopping by, Gerri! Interesting post. There’s correspondence in Granville Leveson Gower’s Letters from Canning, explaining his forthcoming marriage and falling in love. Lucky for him he married a woman of means. Granville was privy to his more intimate information, but as a true gentleman refused to tell his mistress, the Countess of Bessborough. She knew that Granville knew who had the affair with Princess Caroline and tried to coax it from him, to no avail. I didn’t know the Cannings lived at Berkeley Square. Where do you find all this fabulous information? I need to take a look at that correspondence–that’s fascinating. What I’ve found only hints at Canning’s wooing. There is a blue plaque on No. 50 like a historical marker that commemorates Canning’s residence. A recent book notes Canning’s own observations that the house was haunted, but no reference is given for this alleged opinion. I suspect Canning was not the type to admit he saw anything paranormal. He had enough on his plate already. I’m glad you enjoyed the post, Cheryl! I probably get my information the same way you get yours for that fabulous blog you’ve got going. Fishing and hunting. Awesome story! I’m putting the bookstore on my list of places to visit the next time I’m in London. I’d love to meet you there. That would be a lot of fun! Many thanks — writersinthestorm has good writers’ stories.